I wasn't able to solve this, but according to this video (click the link to see the solution; I watched the vid, so I now know the answer), a few Chinese 5th-graders solved the problem in under a minute. That in itself is a hint, by the way. 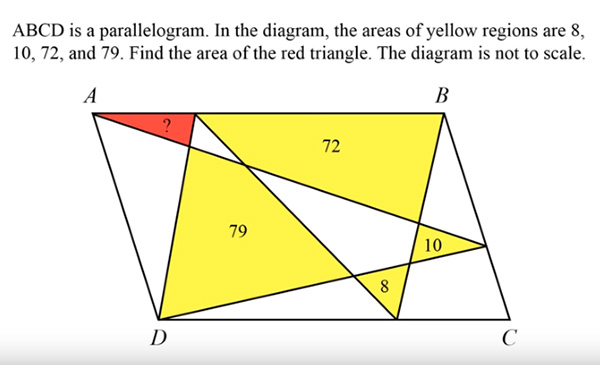 If you solve the problem, leave your answer in the comments, and please show your work/reasoning. I've gotten more stupid as I age. I could follow the explanation, but I doubt that the reputed Chinese fifth graders used the method shown. I suspect that if they did it in less than a minute, they didn't go through the formal methods shown. I was thinking something similar. The only way to solve the problem in under a minute is to have (recently) memorized the specific geometric properties relevant to this particular problem. So I suspect that the math students had just done a unit on triangles and parallelograms and had this "quickie" method fresh in their minds. Fast way, it took me more than one minute, but less than 10. And I am almost 63.
there are 2 triangles whose bases are part of the top and 2 triangle whose bases are part of the bottom. The heights are the same. if you go vertically, there is one triangle whose base is the left side and two triangle whose base is the right side. Again, the heights are the same. And, amazingly, all of the letters cancel out except a, the red area.